For centuries, the process by which most families have planned for their futures has consisted of two traditional planning elements: financial planning and estate planning. And for centuries, 9 out of 10 of those plans have ultimately failed the families they were supposed to protect. 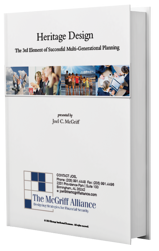 Download this eBook today to learn how this 3rd element of planning can protect your family's financial future.